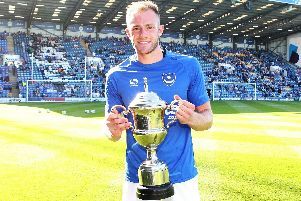 Gareth Evans has spoken of his Pompey pride after being installed as vice-captain. The popular performer was swiftly identified as leadership material following Kenny Jackett’s Fratton Park arrival. Evans served as the Blues’ skipper for their early pre-season games before Brett Pitman took the armband after arriving from Ipswich. The 29-year-old has been officially recognised by Jackett as the Blues’ vice-captain for the campaign ahead – a decision that took the right-sided talent by surprise. We’ve gauged the opinion of our Facebook followers and from the comments on portsmouth.co.uk on whether they agree Evans was the right man to deputise Pitman. I am sure Evans will do a great job and, as fans, we will as always be right behind you and the team. We will do our best to help you out with that ‘shouting at the team’ you mention too! A consummate professional who does a pretty good job playing out of his favoured position and someone who understands Pompey and what we’re about. He puts a shift in, never goes missing during a game and got a decent eye for goal to boot. Thanks Gareth and we look forward to seeing you pull on our shirt once again this season. Shows that getting your head down and doing the job is far more important than any amount of showboating. He should have been captain. Mistake him being made number two.